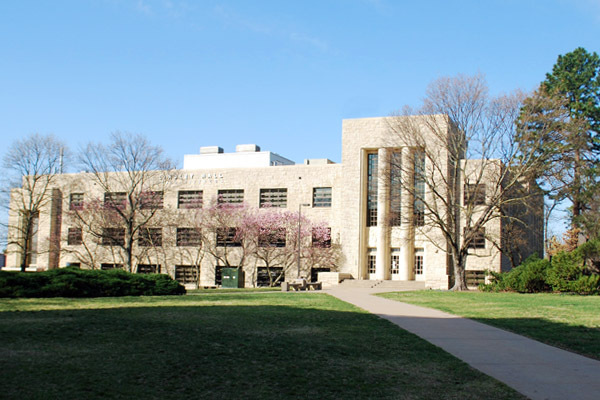 Lindley Hall, home of the Paleontological Institute, on the beautiful University of Kansas campus. PALEO NEWS: The Paleontological Institute is pleased to announce the publication the two latest article in Treatise Online. Part V, Second Revision, Chapter 24: Infraorder Neograptina and family Normalograptidae: Introduction, morphology, and systematic descriptions. Treatise Online 116:1–15, 8 fig. Part V, Second Revision, Chapter 25: Superfamily Retiolitoidea and family Neodiplograptidae: Introduction, morphology, and systematic descriptions. Treatise Online 117:1–8, 4 fig. AND THAT'S NOT ALL: Paul Selden, Gulf-Hedberg Distinguished Professor of Geology and director of the Paleontological Institute, in collaboration with Tae-Yoon Park of the Korea Polar Research Institute and amateur fossil hunter Kye-Soo Nam of the Daejeon Science High School for the Gifted, described a previously unknown spider with reflective eyes which enabled the spider to hunt at night. Their paper was published in the Jopurnal of Systematic Paleontology. BUT WAIT, THERE'S MORE: The Paleontological Institute has created Digital Treatise. Digital Treatise is an online, subscription-based service providing access to the complete content of every previously published volume of the Treatise on Invertebrate Paleontology. Offered as an annual subscripion to libraries and universities, Digital Treatise allows full access for all users within an institution's IP range to all 53 published volumes of the Treatise on Invertebrate Paleontology. Interested? Tell your libary about Digital Treatise. Learn more about how to subscribe to Digital Treatise.